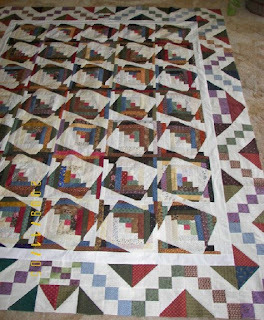 This is one of my next projects, (72 x 92 inches), a scrappy top several years old -- it's time for quilting! Are ya gasping at that quirky border? Look how the border meets at each center - each in a different way! I love it's oddness and can't wait to get it quilted. While this border is a bit - uhhhh, odd with this quilt, it really is one great border. Look how it can fit around the corners if you plan it right. This border is 8 inches wide, but I'm sure the quirky log cabin blocks are larger. If you are wanting to expand your plain borders into a pieced border, this may be a useful pattern. I have dark values as the HSTs, and medium values are the diagonal squares. And wouldn't the border blocks by themself make one great quilt? This pattern is called Jewel Box, and has other names (Buckeye Beauty?) but it's an easy peasy pattern using 2 inch squares and 4 inch HSTs (finished). Meggie, a 3 year-old niece wants a "Fairy Quilt" ... despite stern instructions to myself, "DO NOT BUY MORE FABRIC", I could NOT resist the Keepsake Catalog featuring several versions of fairy fabric. Oh my, it was delivered today and it's gorgeous! The wings are all silvery, and just demand some metallic quilt thread! I'm not decided on the pattern but am tempted to make yet another Kaleidoscope Quilt, this time all soft and fluffy, a place where fairies would live. I planned the fairy fabric for the back! 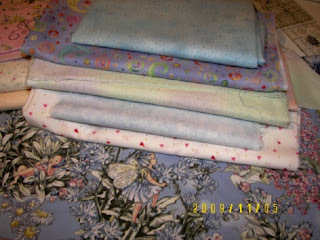 I even HAVE fairy fabric that I had planned to use but like we frequently do, needed MORE! Well of COURSE you need to buy new fabric for a sweet 3-yr-old! And that is a great border --interesting and fun. It has personality, always a great big plus in a quilt. That is a very unusual border but I really like it. I am very lazy about borders and always seem to do plain ones. The fairy quilt will be adorable I'm sure. Oh, I absolutely love that quirky log cabin quilt! No wonder you can't wait to get it quilted! That border is just fabulous - I have never thought of using that block as a border, and looking at yours I see how effective it is. Have fun quilting this one! This log cabin is a fun change up from the same old same old. I like it! Fairy quilts were made for three year olds with lively imaginations, you had to do it, lol. You really had no choice, LOL! Fabric purchases are OK...you have a specific purpose, right? Hey, Elaine, I tried to reply to your comment and the address said no reply. Blogger has been doing this occasionally, randomly to people...will you look? I'm trying the Blogger Help Forum to solve the mystery about how the setting of No Reply was put in place. Apparently this No Reply setting is random? or sporadic? 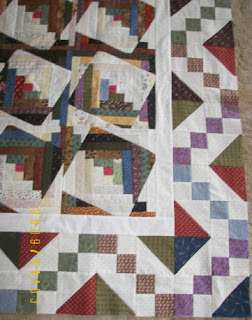 I love the quirkly log cabin top, includig the border that's attached. I just have to find time to make one as my projects are backing up too. My UFOs are growing now instead of decreasing. oh no....another quilt to add to my to do list. But first will need the pattern. Where could I find the pattern???? Today I assembled my Christmas Lights by Bonnie Hunter. I am adding the borders now but took a break to feed hubby and check your blog. Wow Elaine, really like those log cabin blocks -- that's an original setting I've never seen before. Like Suebee I would love to know the pattern. RE: fabric purchases -- yeah I made the same pledge on Wednesday, no new fabric unless it was for projects all ready in house. So of course here it is Friday and I get an email about a fabric sale and a background fabric I wanted for some swap blocks was on now on sale. Whatta ya gonna do, I ask ya? Besides your purchase is for a delightfully good cause! Oh, I remember you making that! It sure is a gorgeous quilt! I'll be interested to see how you quilt it! That is a cool border. I want to try it. And those skewed log cabin blocks are wonderful. Where can i find the pattern? p.s. hurray for 3 year olds who need fairy quilts. How cute is that going to be!!! and fun to do!! I am getting a fairy top in soon to quilt but I think she wants some thread painting. I would be cautious about using metallics for a little girl's quilt, they don't wear as well often & may shred over time.I will be curious to se what you do with these fabrics, Elaine.